My sisters and I share a private little joke about the common stir stick and I know they’ll get a kick out of these crafty ideas. 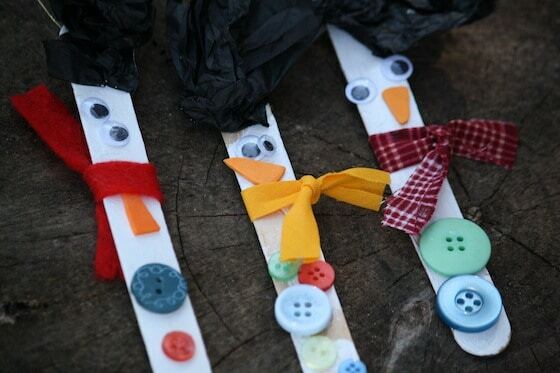 Dollar store paints, a bit of felt and maybe teeny tiny googly eyes for the Santa’s and snowmen. 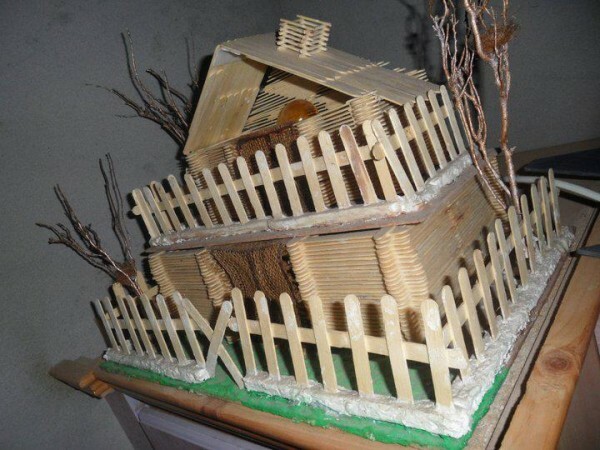 This house is more elaborate and would take hours to assemble, but how awesome would it be stained and strung with tiny little Christmas lights?? These little sleds are just the sweetest! 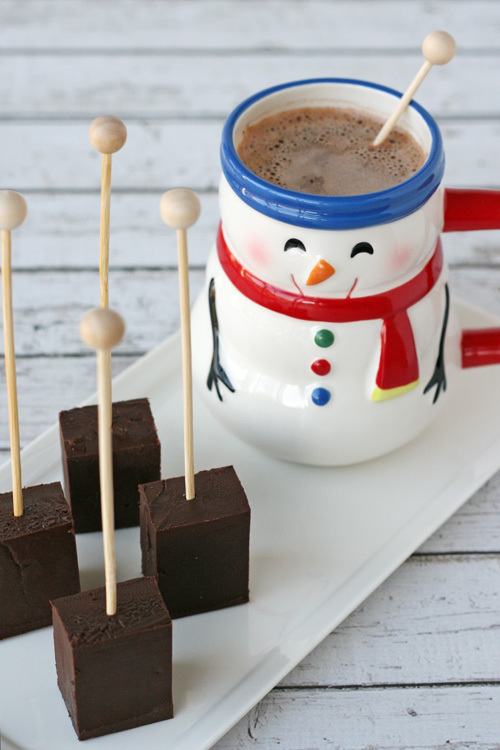 A sweet little gift, or a beautiful treat to serve holiday parties, this Hot Chocolate on a Stick recipe is a perfect holiday treat! Swirl these delicious blocks of chocolate into a cup of hot milk and you create a luscious cup of hot chocolate. This recipe would be perfect to serve as part of a hot chocolate bar at a holiday party! For a pretty display, set out a few bowls of hot cocoa toppings such as crushed peppermint candies, or mini marshmallows and you have a special display that is easy to create. I know I’m always on the lookout for cute little gifts to give to teachers and neighbors, and a few of these Hot Chocolate on a Stick blocks, wrapped up and given with a cute mug could be a perfect little gift! This recipe is quite simple to make and starts with just a can of Eagle Brand Sweetened Condensed Milk, and some good quality chocolate. Swirl these delicious blocks of chocolate into a cup of hot milk to create hot chocolate. 1.) Line a 8″x8″ pan with parchment paper or aluminum foil. 2.) In a medium saucepan heat the sweetened condensed milk and heavy cream together over MEDIUM-LOW heat. Whisk slowly as it heats and heat until it is hot and is beginning to steam, but not boiling. 3.) Remove pan from heat and add the chocolate chips and chopped chocolate. Allow chocolate to slowly melt, this takes about 10 minutes. 4.) Return the pan to LOW heat and whisk vigorously until the mixture is thick and shiny. 5.) Pour the chocolate mixture into the prepared pan, and smooth the surface with an offset spatula. Loosely cover the pan and allow the chocolate to cool slowly, on the counter OVERNIGHT. 6.) The next day, run a knife around the edge of the pan, and pull on the parchment or foil to remove the chocolate square. Cut the chocolate into 1 1/4″ cubes. Heat the knife between cuts by running the knife under hot water, then wipe dry between each cut. 7.) Add a wooden stick, then wrap the cubes as desired. For the wooden sticks, I used these cute wooden sticks from Tomkat Studio. You could also use a wooden fork, or a wooden coffee stir stick (from your local coffee shop).